Next week (14th-21st September) will be Mozilla Service Week. In the midst of it is Software Freedom Day on the 19th and Mozilla’s One Web Day. 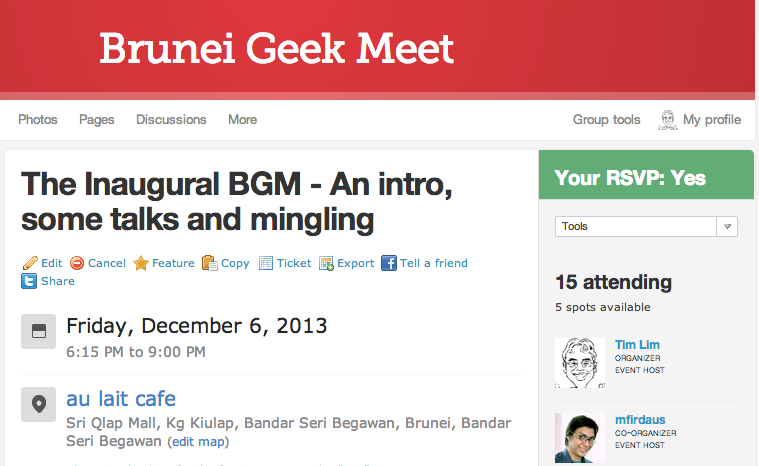 I’m planning to serve/participate in all these events by placing myself in different locations in Brunei each day and just being available to help anybody with their web/technology issues/problems. I have approached some places and to get approval from them to utilize their place for Mozilla Service week. So far I’ve got a green light from Foodzone (Gadong Properties) and Blue Eden/Inderaloka Biru (Kiulap) and I’m trying to get a place in Delima/Serusop (Easyway? ), Gadong central (Coffeebean? Mall food court? ), Lambak (Wywy?) and Bunut Area (Wywy?). Basically all I need is a place to sit down with an Internet connection, power sockets (for me and anybody else who comes along) and accessible to people. P.S. I have to thank @jidah for mentioning Mozilla Service Week and OneWebDay as that’s where I learned about it and thus led to this. It is a network of Young People in Brunei Darussalam who volunteer their time, talent and resources in helping Families in Poverty in Brunei Darussalam by giving them hope, assisting them to get back on their feet to have a better life. The group of young volunteers aim to create a community of youths against poverty. Help achieve HM’s vision of “Zero Poverty by 2035” by mobilizing young Bruneians to engage in positive activities that will help fight poverty, all in the spirit of volunteerism and community service. Ms. Amalinah Abdullah invited her friends to visit some families in poverty in the various districts in Brunei Darussalam. The visits began in early March 2009. She and her friends were deeply moved with the varying situations of these families in poverty that the team wanted to help in any way they can. By just simply donating money will not be enough. Ms. Amalinah and her friends founded “Sounds of Hope”. It is just a small informal group of young volunteers who came forward to accept the challenge of finding out the poorest among the poor in Brunei and look for creative ways to help them. They are now informally called as the SOH Team of Young Volunteers. Ms. Nur Judy Abdullah was taken in as volunteer “adviser” for the team. In the visits that SOH has done, the Ketua Kampong (Village Head), District Office, Officers from the Community Development Department and Islamic Religious Council were kind enough to share with us their list of people in poverty who receive monthly support from the government. There is an upcoming Charity Gala Night which SOH is organising in partnership with the Women Business Council of Brunei Darussalam. 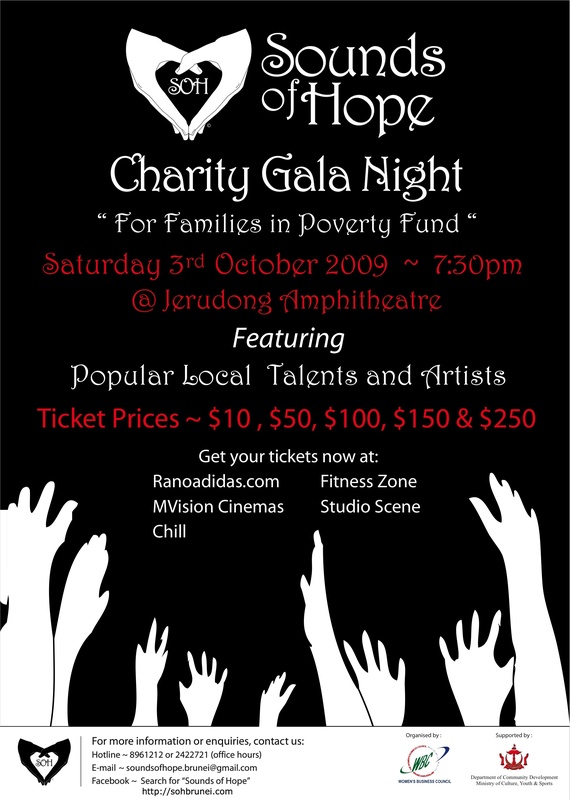 The Charity Gala Night has been approved by the Ministry of Home Affairs this coming 3rd October 2009. The aim of the event is to raise more funds for families in poverty and assist them in various ways specifically in the areas of skills training and further education. SOH is open to partner with other relevant NGOs and GOs on activities related to poverty reduction. We hope to mobilize the youths in Brunei to take an active role in advocating for poverty reduction in their own communities. SOH will soon expand its team of young volunteers to the four districts of Brunei Darussalam. Road shows/ conferences/ exhibitions will be done in the future featuring the many faces of poverty in Brunei to inform and make the youths aware on how they can participate in meaningful activities that will make a difference in the lives of families in poverty in Brunei Darussalam. The spirit of volunteerism will be promoted among the young volunteers through the sharing of their time, talent and resources. The youths will be the future leaders in their own community and the best way to enhance their social consciousness level is through involvement on poverty reduction activities. Creative activities to raise funds for families in poverty will be spearheaded by SOH Team of volunteers. We are working on a website to post photos of our volunteer efforts and the families we have helped. We have taken videos of our visits and will continue to document our various efforts for the benefit of the volunteers, families in poverty, government agencies and donors. A community forum in the internet will be developed to allow the youths in Brunei to voice out their ideas and advocacies in relation to HM’s titah on “zero poverty in 2035”. A donor/sponsor can adopt a family in poverty and SOH team of volunteers will help facilitate the funding for a specific project like home repair, payment of debt (if qualified), buying of boat (for some fishermen who depends on fishing for living), buying of wheelchair for disabled people, hearing aid for the deaf, or walking cane for the blind. There are children who cannot go to Religious school because they cannot afford the uniform. Others cannot afford the books, bags and school projects and other fees in school. Low educated women who are divorced or widowed can create or supplement their income through home-based self-generating income activities. They can only do so if they are trained in various skills such as beading (doing beadworks for clothes), massage, cooking skills, gardening, handicraft making etc. When the women gain skills after the training, they will need some small capital to start their business. A microcredit scheme will be most helpful to jumpstart their small business. ” Sounds Of Hope ” (SOH) is organizing a charity gala night , which is supported by the Women Business Council of Brunei Darussalam. The SOH charity gala night is held to raise public awareness for the Brunei families suffering from poverty. The organizer is working on raising funds to help these families in easing their financial burdens as well as improving their living conditions and their daily life. If all goes well and as planned, the charity gala night will be held on October 3, 2009 at the Jerudong Park Amphitheater around 7pm. The team, made up of Brunei’s own concerned youths, had recently visited homes of Brunei families in poverty and will continue to visit more homes within the four districts over the next few months. The visit is aimed at giving SOH young volunteers to have a first hand experience on the living conditions of families in poverty. What the team found was disheartening. There are families that need immediate help and these families seem to have been overlooked by the Bruneian community. The families that SOH is helping are not only Brunei Malay Muslims but also those who are permanent residents. Volunteers of SOH got a glimpse of their living conditions and their daily lives. Through interactive discussions with members of the impoverished families, SOH found out what these families needed and realized what actions can be taken to give them immediate help. This initiative is a response to a Titah made on 4th of March 2008 during the opening ceremony of the first meeting of the 4th session of the Legislative Council by His Majesty the Sultan and Yang Di Pertuan of Brunei Darussalam, where the monarch expressed his desire for the country to achieve zero poverty rate by 2035. SOH became aware of the lack of a specific non-government organization in Brunei to help those suffering from poverty. SOH feels that they need to take the first step to address this issue. One of the ways they feel that they are able to help is by organizing a charity concert to raise funds to help these families. At the same time, sounds of hope wishes to promote local talent through this charity concert. Auditions have been held and potential performers have been selected to perform for this charity event. After the Charity Gala Night , the funds raised through out the charity drive will go towards helping these families in poverty wherein a special committee for SOH will be formed to managed donations and funds raised. Regular updates on where the funds go and who are the beneficiaries will be posted in the website of SOH. Before the recipients of the funds are selected, their living conditions will be monitored and their background will be examined and at the same time all caution will be taken to ensure that only those who truly need the help will receive assistance. Sounds Of Hope feels that it is time everyone gets together to address poverty in Brunei. YOU WANT TO BE A VOLUNTEER? For those who wants to become an SOH Volunteer, please email to soundsofhope.brunei_AT_gmail.com your answers to the following questions: How do you define poverty? What does poverty mean to you? Do you have the time, talent and resources to be an SOH Volunteer? If yes, please describe how you can help. Please leave your name, brief profile, why you are interested in the issue on poverty and contact details.